Balloons-001 Graphic image of hot air balloons. Great for balloonists, travel agents, etc. Use bold fonts with contrasting medium/thick outline for best results on photos or busy background images. Clouds-001 Photo image of clouds in the background. Great for churches, hospitals, gift shops, airline companies, etc. For best results on photos or busy background images, use bold fonts with contrasting medium/thick outline. Can also be printed without the cross with wings, just note that in the comments area of your order. Cross-001 Colorful graphic of a cross and a sunrise/sunset. The background color of this image can be changed. If you prefer a different color just let us know in the comment area of your badge order. This image is great for church groups, etc. Sun-001 Colorful graphic of a sun. Great for gift shops, health care providers, church groups, etc. Sun-002 Colorful graphic of a sun. Great for gift shops, health care providers, church groups, etc. Great companion item to the Sun-001 image. For best results use bold fonts with contrasting outlines. Sun-003 Colorful graphic of a sun. Great for gift shops, health care providers, church groups, etc. Sample shown is on our 2" x 3" badge size but works well on all badge sizes including the oval. The font used in the sample is Baskerville Med (you can ask for this font in the comments area of your order) in pale yellow with a deep red outline. Sun-004 Beautiful graphic of a sun and clouds. Great for gift shops, health care providers, church groups, travel agents, etc. Sample shown is on our 1.25" x 3" badge size but works well on all rectangle badge sizes. The font used in the sample for line 1 is Comic Sans in deep navy and line 2 is white with a deep navy outline. Eagle-01 A beautiful graphic of a bald eagle. 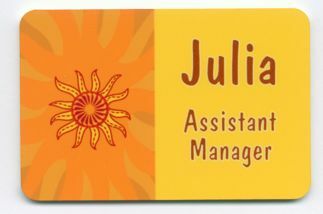 This sample is shown on a 1.25" x 3" badge and will work well on any of our rectangular badge sizes. The fonts are: Arial rounded for lines 1 and 2 and Arial narrow for line 3. Balloons2 Graphic image of a hot air balloon. 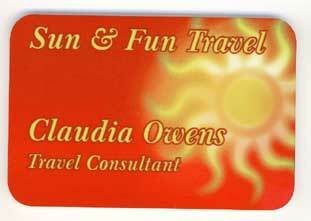 Great for balloonists, travel agents, etc. The sample shown is our 1.5" x 3" badge using a white with deep navy blue outline Dom Casual font. Note in the comments area of your order if you want different colors for the balloon.